Increasing numbers of women are giving birth in their forties, fifties, or even later. 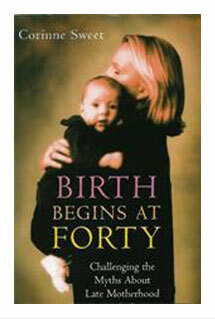 First births to women over forty is now 2%. For some it will be their first baby. What was unusual twenty-five years ago, is now becoming quite common, although seen as controversial. Yet little has been written about this dramatic social shift. This book tells all and is the result of honest, revealing, heart-rending, interviews. It includes how women made the decision to have a baby late, the risks with late motherhood, combatting age prejudice, having another baby, getting life back on track and fathers over forty.